Is that horse grimacing in pain? Does your horse grimace in response to pain? Yes, according to researchers from Italy, Germany and Britain, who have developed what they call the Horse Grimace Scale. The six researchers, monitoring stallions who underwent castration, developed the standardized scale of facial expressions to help horse managers discern pain. Dr Michela Minero and her colleagues believe the scale could assist the welfare of horses who have undergone routine surgical procedures. The researchers, whose findings have been published in the open-access journal, PLoS ONE, said the recognition and alleviation of pain was critical for horse welfare. “Although considerable progress has been made in understanding physiology and treatment of pain in animals over the past 20 years, the assessment of pain in horses undergoing management procedures, such as branding, pin firing and castration, remains difficult and frequently suboptimal,” they said. “Even though castration of horses is a common procedure, no gold standard for pain assessment is available to date. Forty-six stallions of varying breeds, aged 1-5, were used in the study. They were divided into one of two treatment groups and a control group. Treated horses underwent routine surgical castration. A horse in the study is monitored by video following castration. Group A, comprising 19 horses, received one injection of Flunixin-Meglumine, commonly known as Banamine, immediately before anaesthesia, while group B, made up of 21 horses, received the same drug both before anaesthesia and six hours post-operatively. A control group of six horses requiring non-invasive diagnostic procedures under general anaesthesia were also used in the study. All of the horses studied were hospitalized for five days. As a baseline, high-definition videos of the horses were taken both for 30 minutes on the day prior to surgery, and eight hours post-operatively. 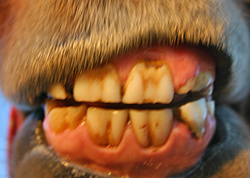 Video recording continued over the five-day period, from which high quality images of the horses’ faces were extracted. Images of each subject before and eight hours after surgery were compared to identify changes in facial expressions associated with these procedures by a trained treatment observer experienced in assessing facial expressions in other species. The observer did not know the treatment groups into which each horse fell. Strained nostrils, and flattening of the profile. Each indicator is scored on a scale of 0-2, with 0 meaning not present, 1 meaning moderately present, and 2 meaning obviously present, giving any one horse a maximum rating on the Horse Grimace Scale of 12. The researchers noted that pain-related behaviors occurred predominantly eight hours after the operation, suggesting it was a critical time for pain evaluation. When tested on a group of five treatment-blind observers, the researchers found the scale to be reliable and consistent across different observers for each animal. The authors noted that the changes in facial expressions linked to pain appeared to be similar to those previously described in other species, with some subtle variations. They said it had been clearly demonstrated previously that pain in horses can be expressed through other general non-specific indicators such as decrease in normal activity, lowered head carriage, fixed stare, rigid stance and reluctance to move. Indeed, in the present study, horses undergoing routine castration showed the tendency to keep their head in a lower position eight hours post-surgery. “The results of this study demonstrate that the Horse Grimace Score is a potentially effective method of assessing castration-related pain in horses,” the researchers concluded. The overall accuracy of the scale was assessed at 73.3 percent. They suggested the use of the scale for scoring post-operative pain had distinct advantages over that of manual behavior analysis, which can be complex due to the greater number of behaviors that potentially needed to be scored. “Behaviour-based assessments appear to be more time-consuming to conduct (analysis time was 20 hours for behavioural-based assessment compared to 40 minutes for the Horse Grimace Score). The authors stressed that more validation work was needed, but the results suggested it may offer a more reliable tool for assessing post-castration pain than other routinely used methods. The Horse Grimace Score for two horses, before the operation (left) and eight hours after routine castration.